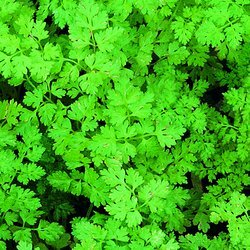 Feathery flat green leaves with serrated edges&comma; Slight Aniseed flavour which is lost quickly when cooked. Can be used for soups&comma; salads&comma; sauces&comma; chicken & fish dishes&comma; etc. Roughly 6-8 weeks after planted.